One of my staples for sale at craft shows is slotted coin displays. They are fairly simple to make and I try to make them in batches so I have inventory without setting up too often to make them. This dunnage is roughly 2 by 2 1/2 inches and either 24 or 36 inches long. 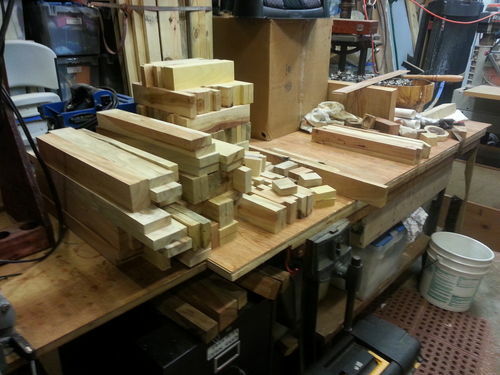 I pick out the pieces I want to make the holders out of and joint one or two sides. Instead of planing the opposite sides I normally rip them to make the blanks smooth and parallel. 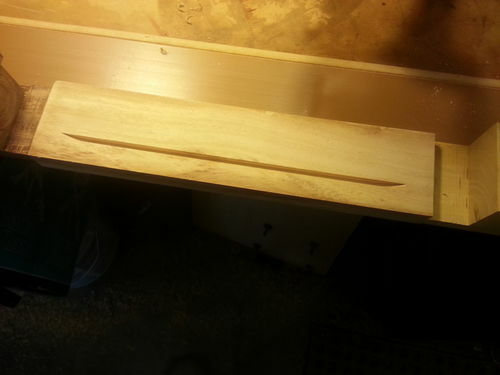 I use at least a 40 tooth carbide blade which leaves a very smooth surface, usually better than the planer. Next I rip the blanks into two pieces. Sometimes I try to make them the same thickness. Some I will intentionally rip into a thicker piece and a thinner piece. This allows me to have book-matched sets that are either the same height or slightly offset. 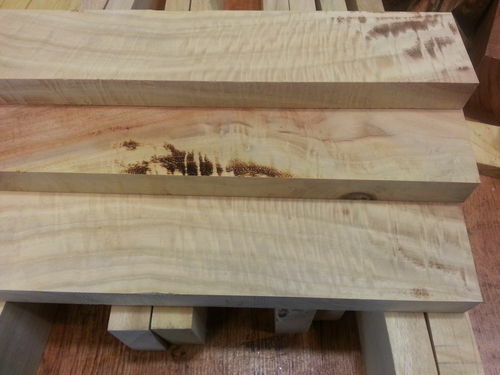 Some of the wood is so figured that while I’m ripping the blanks in two I get a lot of curve in the wood. 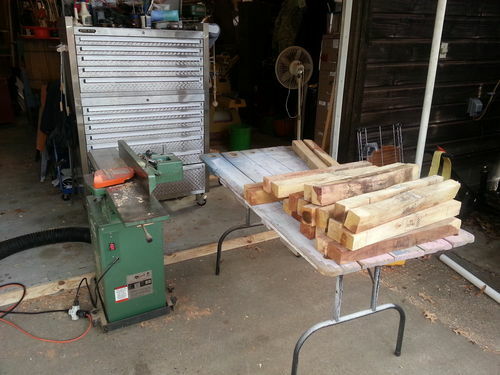 The saw doesn’t have a riving knife so I have to keep an eye on the outfeed and watch for a closing up in the kerf. Sometime it will scorch a little. 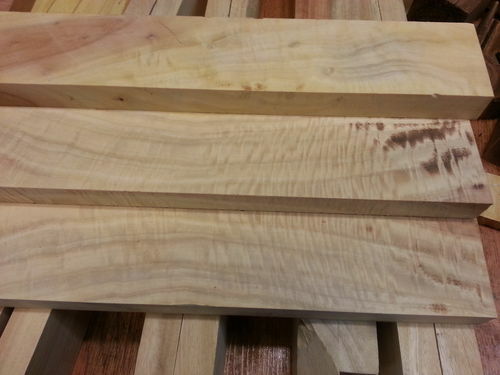 Those pieces are set aside and allowed to rest, then they are cut into shorter lengths or used for other projects. 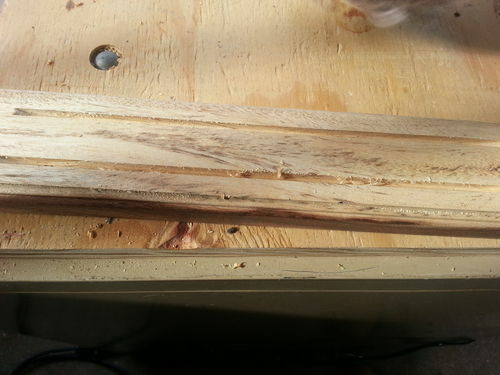 Figure the odds, the really pretty figured wood is the worst for curving in. If any pieces come out of the cutting process with too much tooth marks or schorching I sand them to 220 grit on the 6x48 belt sander. 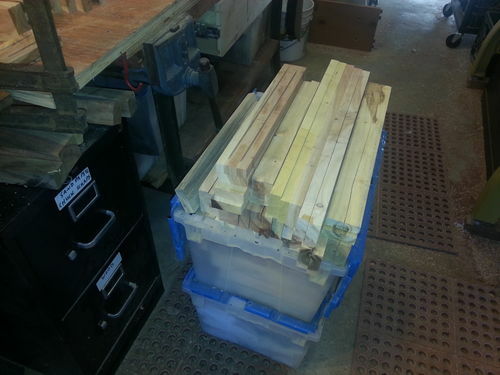 I end up with a lot of wood that is ripped in two. 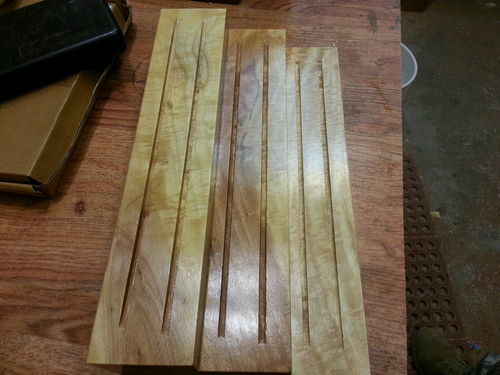 After cutting and rough smoothing I cut the grooves. 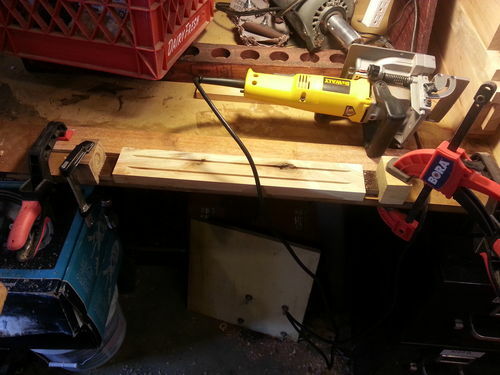 I have found that my DeWalt biscuit jointer makes perfectly sized grooves. 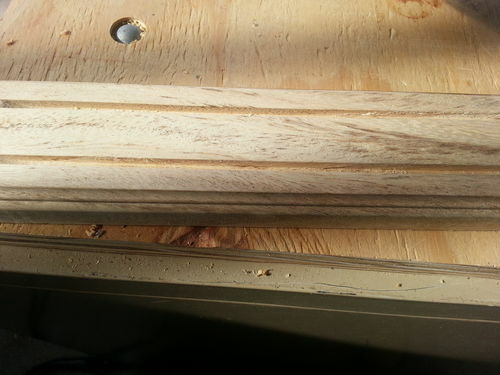 In addition, as opposed to cutting grooves on the tablesaw where they would run off the ends due to blade curvature, the biscuit jointer bit has a tight enough radius that I can start and stop the grooves about 1/2 inch from either end. 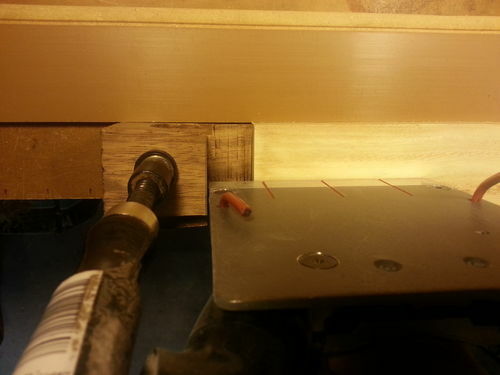 The jointer pins that are normally extended to prevent the jointer from moving when you plunge it I keep retracted so that I can slide it like a router along the blank. Due to the weight of the jointer, my age, and the amount of grooves I cut (880 linear feet in the last batch), I rigged up a production area that lets me suspend the jointer from the ceiling of the shop on a bungee cord. 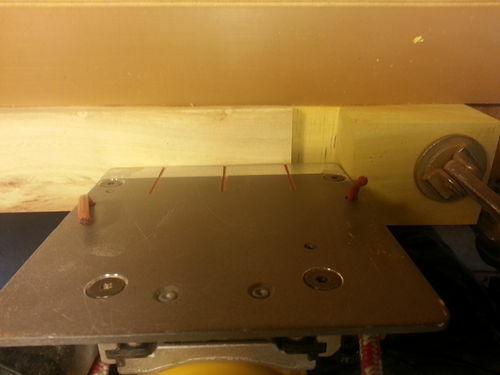 The bungee holds the jointer throat just at the height of the blank surface so there is almost no effort on my part to grab it, put it in position, and cut the slot. I hold the blanks in position with a piece of old flooring at the back, clamped to allow the edge of the blank to just stand proud of the RAS table where I cut the grooves. 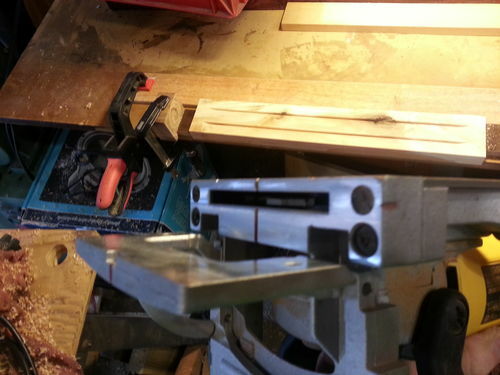 I have two stop blocks that are clamped in place to prevent the jointer from running off either end. The left stop block is stationary and is notched out lower than the blank wide enough to stop the jointer about 1/2 – 3/4 inch from the end. 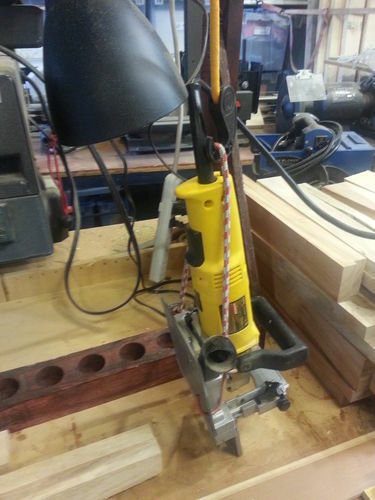 The right end block is cut identically to the left one and is re-positioned for each blank due to differences in length using a kreg vise grip clamp. Set blank in position and clamp stop block in place. 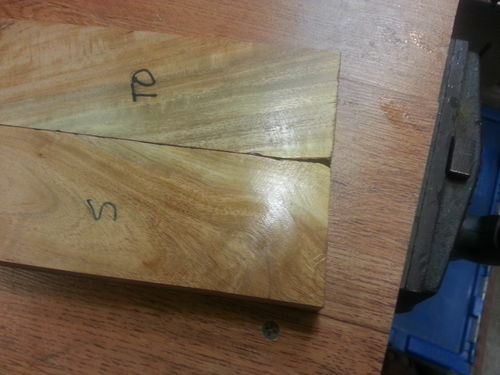 Flip blank 180 degrees and joint second groove. 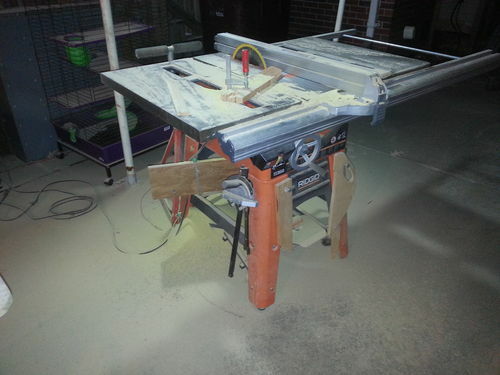 It’s a fairly quick process once the work station is set up, about 30 seconds to route both grooves. Here’s about 880 feet of coin holders with slots cut. 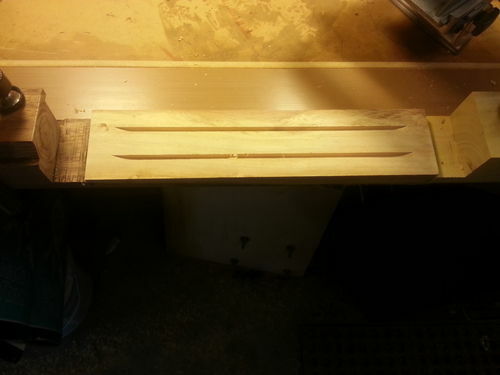 Because the edge jointer and table saw cut very smoothly I can usually hit the blanks once with a 320 grit sanding mop. If I discover saw marks or some other blemish that requires more work I may go back to the belt sander, or switch to a 220 grit mop. The 320 grit is aggressive enough to knock the edges down and smooth the surface without attacking or rounding the edges too much. After sanding I wipe on a thin coat of 2# shellac as a sealer. As soon as I wipe it on I wipe it off, it’s only to seal the grain. I’ve played with other finishes, teak oil, BLO, poly, lacquer, but the shellac just does what I need better and quicker (and cheaper) than the others. After the shellac dries, and on cold days before it dries I start the polishing process. I use the Beall Buff System to polish the wood. It’s a fairly straight forward process, red compound and wheel for rough polishing, white diamond compound and wheel for final polishing, carnauba wax and wheel for final finish. It puts a mean shine on hard wood. 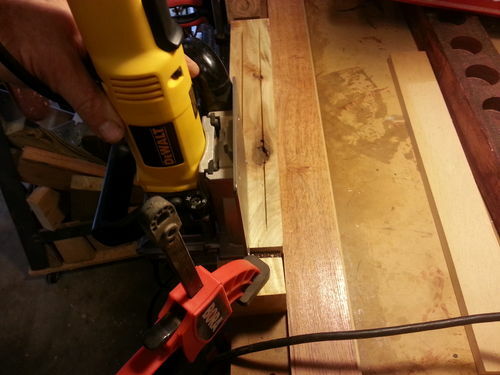 FYI: I have a Slot Cutter router bit that I think could also cut those slots… I would have to try it… sounds easier & safer to me. Very creative and resourceful process Pete. Amazing wood too, and it looks wonderful after finishing. I’ver never seen any pallet wood like that here, but I will keep my eyes open for it in the future. 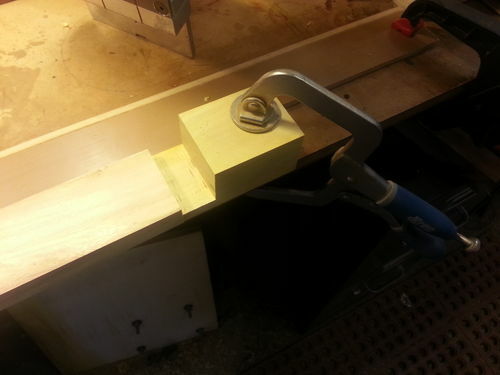 I got a slot cutter bit for that very purpose, but I’ve found the biscuit jointer really works better. 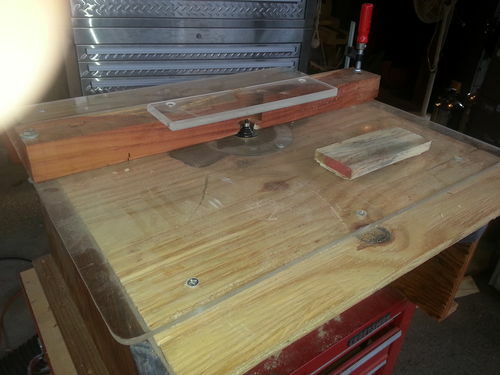 The two fences of the biscuit jointer lock the blank into position better. 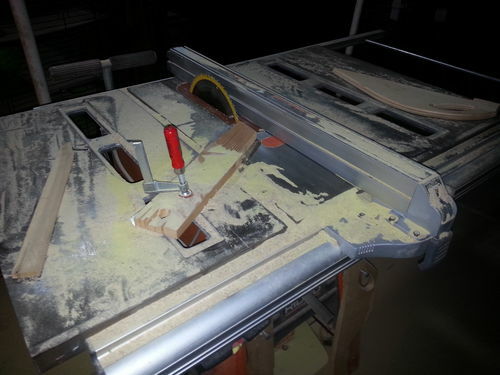 And I found that picking up the router table to slide it along the blanks was very tiring, what with the tool chest the whole thing is bolted to….. I gotta make a video of the slot cutting process. A different way to make a long slot, but, hey, it works and looks gr8. Ha!, I can picture you holding your router table upside down and routing that little slot on that short board… That’s purdee funny.